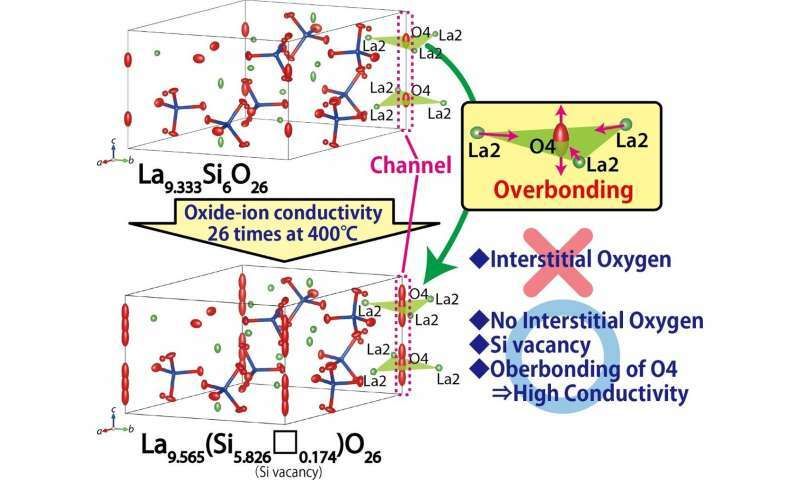 Scientists at Tokyo Institute of Technology and collaborators have shown the overbonding of channel oxygens in La-rich apatite-type lanthanum silicates, rather than the presence of the interstitial oxygens, to be responsible for the high oxide-ion conductivity. This concept of "high oxide-ion conductivity by overbonding" opens the door for designing better ion conductors, which could be useful in energy conversion and environmental protection. Solid oxide electrolytes have been extensively studied due to their wide range of applications in solid oxide fuel cells (SOFCs), oxygen membranes, catalysts, and gas sensors. Electrolytes with high oxide-ion conductivity at temperatures below 600 degrees C are required to decrease the operation temperature of SOFCs. Professor Susumu Nakayama at National Institute of Technology, Niihama College has discovered in 1995 the extremely high oxide-ion conductivity in the intermediate temperature range below 600°C, which has encouraged many researchers to study the structural origin of this phenomenon. It was believed that the high oxide-ion conductivity of apatite-type materials is due to interstitial oxygens. However, in this novel study, Professor Masatomo Yashima, Dr. Kotaro Fujii at Tokyo Institute of Technology (Tokyo Tech), and their colleagues have shown that apatite-type materials contain Si vacancies, but not oxygen interstitials. The Si vacancies in the materials have originally been proposed by Professor Koichiro Fukuda at Nagoya Institute of Technology. Through single-crystal neutron diffraction studies using the SENJU diffractometer installed at MLF, J-PARC facility (Figure 1), they were able to accurately determine the crystal structures of the apatite materials La9.333Si6O26 and La-rich La9.565(Si5.826□0.174)O26 (□ denotes Si vacancy) including occupancy factors, atomic displacement parameters, and spatial distributions of oxygen atoms. They also measured the density and oxide-ion conductivity of the two materials. In this work, La9.565(Si5.826□0.174)O26 was selected because of its high oxide-ion conductivity. By structure analyses using the diffraction data, the researchers found Si vacancies, no interstitial oxygens, and larger positional disorder of the oxide ion at the O4 site in the apatite channel as compared to the basic material La9.333Si6O26 (Figure 2). The lower activation energy for the oxide-ion conduction along the c axis was found to be the main reason for the higher oxide-ion conductivity of La9.565(Si5.826□0.174)O26 as compared to La9.333Si6O26. The excess La yielded the overbonding of the O4 oxide ion in La9.565(Si5.826□0.174)O26 as compared with La9.333Si6O26, which led to higher oxide-ion mobility and conductivity of La9.565(Si5.826□0.174)O26 with Si vacancies (Figure 2). Density measurements by the Archimedes method supported the presence of Si vacancies in La9.565(Si5.826□0.174)O26. Thus, the researchers proposed that excess La cations are responsible for overbonded channel oxygens along the c axis, which leads to highly anisotropic atomic displacement and high oxygen mobility. Hence this novel concept of "high oxide-ion conductivity by overbonding" may be useful for designing better ion conductors.